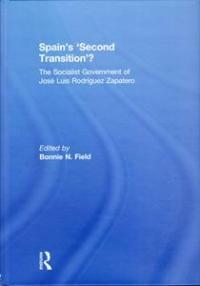 Considering the developments and reforms that occurred under Spanish Prime Minister José Luis Rodríguez Zapatero between 2004 and 2008, Bonnie N. Field and contributors analyze the patterns of continuity and change and provide a critical evaluation of the concept of a ‘second transition’. Sebastian Balfour finds the title problematic, but praises the book for restoring balance to the almost uniformly negative judgements in the media about the last Socialist administration. Spain’s ‘Second Transition’: The Socialist Government of Jose Luis Rodriguez Zapatero. Bonnie N. Field. Routledge. 176 pages. The legislative record of Zapatero’s first government of 2004-2008 has largely been buried under the avalanche of criticisms for its perceived mishandling of the economic crisis during his second administration of 2008-2011. The fact that Zapatero’s economic policies in 2010 moved from Keynesianism to cuts in social expenditure in response to neo-liberal pressures from the EU and the markets merely served to bury his reputation even deeper. Yet his dilemma was that of all social-democratic parties in power. Social-democracy can function effectively in times of economic growth, as Zapatero’s first government did. During economic crises, social-democratic governments and their social partners can no longer easily extract the social benefits on which their identity and legitimacy largely rest. It is no coincidence that only 4 or 5 social democratic governments have survived the crisis in Europe and of these several are in power as a result of electoral cycles rather than electoral consolidation. Thus, the poor results of the 2011 general election in Spain place the record of the first administration of Zapatero into a rather bleaker perspective than that outlined by Spain’s ‘Second Transition’: The Socialist Government of Jose Luis Rodriguez Zapatero, edited by Bonnie N. Field, which confines its analysis to the 2004-8 period, though it was published in the last year of Zapatero’s second government. The new civic movement which several of the contributors claim his first administration helped to forge through its liberalising social measures failed to provide the electoral ballast for the party in the elections of November 2011. Like many edited academic books assessing contemporary politics, this one is hostage to the time-lag between the conference on which it is based and the publication of its proceedings. This dilemma is acute in the case of Spain over the last four years or so when politics have been so volatile. Moreover, the title of the book is distinctly problematical. Transitions to democracy refer to specific historical processes of change from dictatorship to democracy and not merely to the sum of legislative and institutional changes. The case for employing the term ‘Second Transition’ derives from the widespread perception that the transition to democracy in Spain was an incomplete process because of the prevailing balance of political power when it was negotiated, even though it became a paradigm for transitions elsewhere. The phrase assumes that this was an open-ended process of democratisation that could be brought to closure through subsequent legislation. Yet it is a term that has been much abused. As the editor acknowledges, it was used by the centre-right ex-President Aznar in his own account of his first government of 1996-2000. Nor is it a term that refers to any corpus of interpretation. On the contrary it is more of a political claim than an interpretative or analytical category. All the contributors come to the conclusion that the ‘Second Transition’ is an irrelevant term as applied to Zapatero’s first government, yet the book and the contributions are structured around it as if it were a dependent variable. In fact most of the contributors are at pains to stress that the Zapatero government’s policies between 2004 and 2008 were marked more by continuity with previous administrations than by change. Though they acknowledge Zapatero’s efforts to promote a new social agenda and transform Spanish socialism, they find that his policies were characterised at best by incoherence and at worst by largely unrealised commitments. Sebastián Royo’s analysis of economic policy (‘Reforms Betrayed? Zapatero and Continuities in Economic Policy’) makes the bleakest assessment of them all. Zapatero failed to address the core problems of the Spanish economy such as low productivity and the loss of competitiveness, driven, like his predecessors Aznar and González, to conform to Brussels directives. Bonnie N. Field (‘Minority Government and Legislative Politics in a Multilevel State’) acknowledges the skill with which the minority Zapatero government negotiated the complex business of seeking alliances across governance levels in a multilevel system but agrees with Royo that economic policy was marked by continuity and failure. Diego Muro (‘Territorial Accommodation, Party Politics and Statute Reform in Spain’) argues that while the Zapatero government was more sympathetic than the Aznar administration to demands for greater devolution, the initiative for reform came from the periphery rather than the centre. Charles Powell (‘A Second Transition, or More of the Same? Spanish Foreign Policy under Zapatero’) dismisses the claim of a Second Transition, as do almost all the other contributors, on the grounds that Zapatero’s foreign policy was marked by contradiction and by continuity with that of previous governments. Only Omar G. Encarnación (‘Spain’s New Left Turn: Society Driven or Party Instigated?) makes claims of radical innovation on the part of the first Zapatero administration. He believes that the Spanish Socialists were foremost among the new West European left in shifting from the old politics of redistribution, welfare and workers’ rights to new policies around the environment, gender parity, gay rights and multiculturalism. And he argues that this transformation was driven more by the PSOE leadership than by the effects of societal change. In the light of recent events, however, it seems somewhat overstated to claim, as Encarnación does, that Zapatero’s government was ‘paradigmatic’, a ‘model for social-democracy’ elsewhere. The gains made by the PSOE in the elections of 2008 among new social constituencies were largely dissipated by the effects of the economic crisis and many left voters shifted their allegiance in 2011 to the more radical Izquierda Unida, or United Left. Nevertheless, we should be grateful for this book for restoring some balance to the almost uniformly negative judgements in the media about the last Socialist administration. It provides a well-written and broad-ranging analysis of the first Zapatero government which should be required reading for students of contemporary Spanish politics. Sebastian Balfour is Emeritus Professor of Contemporary Spanish Studies in the Department of Government at the London School of Economics.